UTV Cab Best Buy Guide. Looking for more protection than UTV windshields offer? 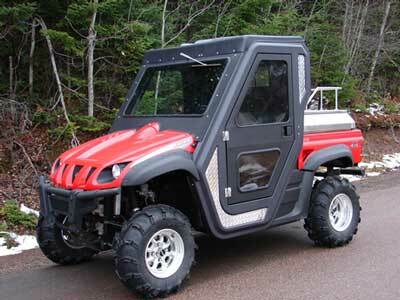 Then UTV cab enclosures are your next step up. Again, you have several options depending on your needs. We'll cover the three main types below. We included some cabs for sale on Ebay at the bottom of the page. Be sure and browse those just to see what kind of deal you can get. Full hard cab enclosure - offers the most protection. Usually made from ABS plastic or fiberglass. These cabs do a pretty good job of keeping the elements outside where they belong. They can be removed, but it's not something you want to be doing very often. The hard cabs are the most expensive, heaviest, and most difficult to put on and take off. If you use your UTV a lot in bad weather, a hard cab is the best choice for maximum protection and comfort. Just think of it as a semi-permanent installation. UTV Hard Cabs - Check here for today's Best Buys. 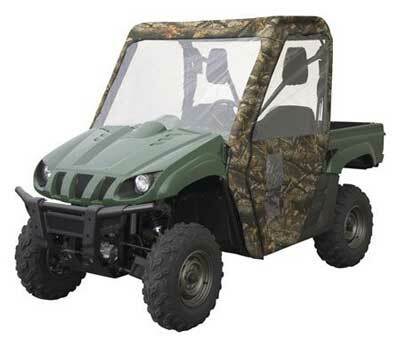 Full soft UTV cab - Has almost as much protection as the hard cab at a much lower price. Made from some form of heavy duty nylon in most cases. Marine grade being the top of the line. Offers the most configuration flexibility. They can be combined with a hard windshield and back window, or can be made with an integrated clear vinyl windshield and windows. Zip out doors are another option. Most can be zipped out and rolled up for storage. Or you can roll them down partially for better ventilation in warmer weather while still providing good protection. Some cabs use an aluminum door frame which can be used as full doors, half doors, or just the lower tubular structure. Throw in a cab heater, and you can be comfy in a wide range of temperatures and conditions. Mounting is relatively easy with a system of velcro strips, buckles and straps, and self adhesive tape. Not as permanent as the bolt on hard cabs, once mounted, it's fairly secure. UTV Soft Cabs - Best Deals Today! Mini cab - For about the same price as a lexan windshield, you can have a mini soft cab that includes a vinyl windshield and rear window along with a top cap. That's a lot of protection for a very affordable price. 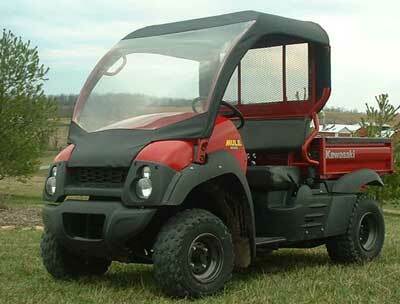 If you live in a warmer climate where you could do without the doors, I would give a mini UTV cab a serious look. UTV Mini Cabs - Today's best buys. Soft Top Roof - This can't really be considered as a UTV cab, but we felt like we still needed to include them since they have become so popular. If already have a windshield, a soft top is a good alternative for providing a good bit of extra protection without the cost of a fully enclosed cab. They work great as a sun shade, and will keep you reasonably dry in anything but a monsoon class rain storm. Many come with some sort of roll down rear window or net that will help keep dust from rolling in from the rear. 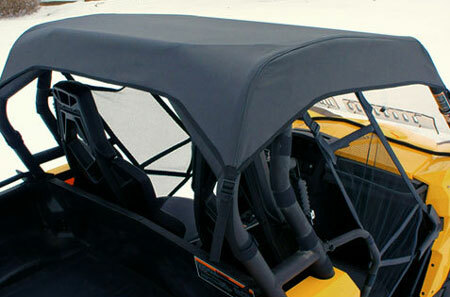 Roll up pouches are another popular feature that come with many of the UTV roofs. If you're like us, you never seem to have enough storage room for all the things we think we just have to take with us! Since most of the UTV soft tops are value priced, they may actually be the best deal for the amount of protection they provide. UTV Tops - Great deals on UTV soft and hard tops.